Tall Bearded Iris 'Norma of Irwell' has been awarded the Dykes Medal (NZ) for 2012, hybridised by New Zealand's wizard of Tall bearded Iris breeding Ron Busch and named after Ron's lovely wife. Introduced by Julie May from 'The Iris Garden' who has always raved about this iris. Well substanced blooms with dark violet ruffled and slightly open standards with even darker violet slightly flared and ruffled falls that has an eye catching small white area beneath the violet tipped bronze beards, oh and not forgetting the very good branching and great plant health that we have all come to expect from the Busch breeding lines. A magnificent Iris from an magnificent breeder and my heartfelt congratulations to Ron. NORMA OF IRWELL Ron Busch, Reg., 2008. Sdlg. 91-200. TB, 34″, (86 cm), M. Standards and style arms deep purple; Falls, Violet purple, white around beard; Beard bronze tipped violet. 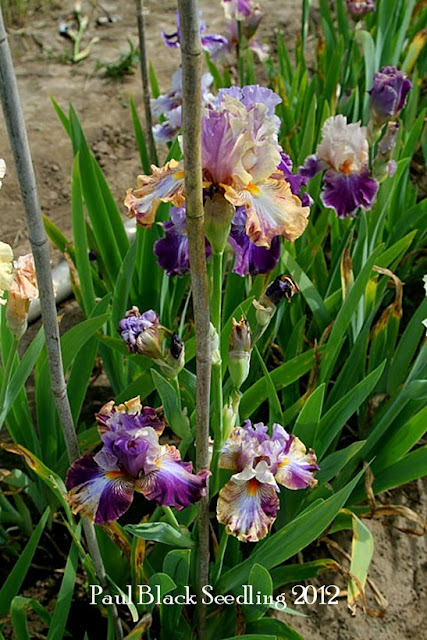 (Vigilant X Edith Wolford) X ( Honky Tonk Blues X Brookside) The Iris Garden, 2008. Dykes Medal 2012 (NZ). Photo credit Ron Busch. Copyright Iris Hunter. 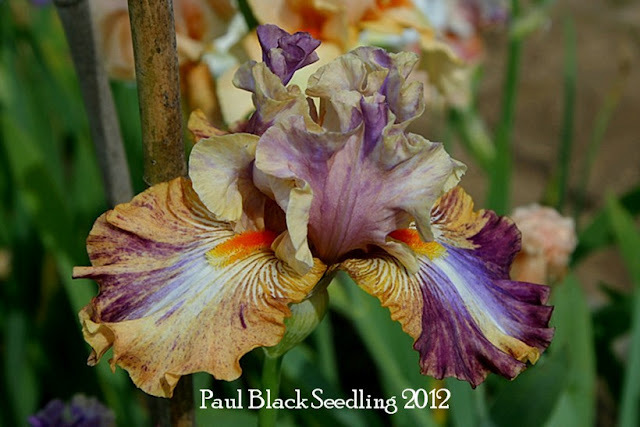 Paul Black's Favorite Iris Seedling 2012. Email received from Paul Black today who writes "We've had quite a nice bloom season with just enough adverse weather to challenge the durability of the irises we grow. Here is a picture of Mid-America Garden on May 20. I'm also attaching a picture of one of my favorite new seedlings for this year. It is a broken color line that comes from completely different breeding than the old Ensminger / Kasperek lines." My first impression 'An outrageous prism' and you can see with the clump shot every petal is totally different, its certainly unusual. Here's hoping it passes all the hoops for introduction and long may it live!!! 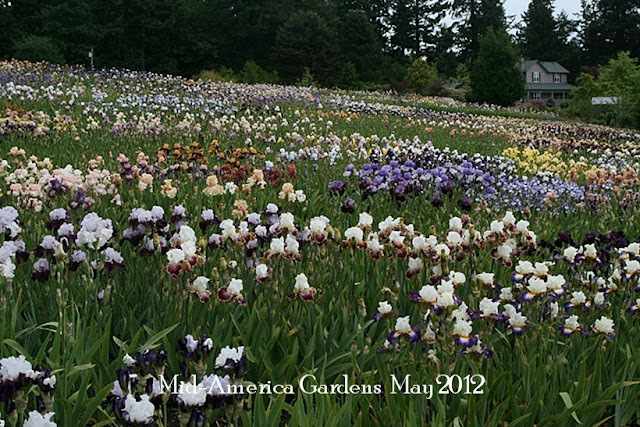 Hows that for a Iris garden! Over recent years there was a lot of whoop and holler about the difficulty of importing irises to New Zealand. Believe it or not, this issue raised its ugly head again with regard to a couple of new unusual colour-toned plicatas shown in recent international Iris publications and also featured in catalogues that have been received in New Zealand. These new irises have colours very similar to 'Surfie Girl'. It gave the last gaspers a chance once again to resurrect the monotonous moaning regarding the lack of ability to import new Irises to New Zealand. Hells bells, it would need someone in New Zealand with time on their hands to take on the fight with the agricultural authorities and a very large chest of money to pay for the huge expense that would be associated with the importation. This is all before even finding an overseas supplier (with a great sense of humour) that would want to take on the similar amount of expense and time for a very small order by their scale of things. You would have to agree the idea is a dog with fleas. In fact, you would think it would be cheaper to pay an quality overseas hybridizer to come to New Zealand for a couple of weeks to make some crosses which, if coupled with extensive training of New Zealand hybridisers, wouldn't be such a bad idea. SURFIE GIRL (Blyth 93 Aust) E-L 36" A high bud count gives this iris a long rewarding season. It is a plicata with standards of tarnish beige, falls are white with a ½" violet stitched edge, deepening at the hafts to a reddish tan. Light mustard beards add to an effect that will give a great garden display as well as winning on the show bench. SURFIE GIRL Barry Blyth, Reg. 1993 Sdlg. Z69-3. TB, 38" (97 cm), EML ; S. light tannish beige; F. white with 1/2" stitched edge of bishops violet, deepening at hafts to reddish tan; beards light mustard. Lark About X Snowbrook. Tempo Two 1993/94. 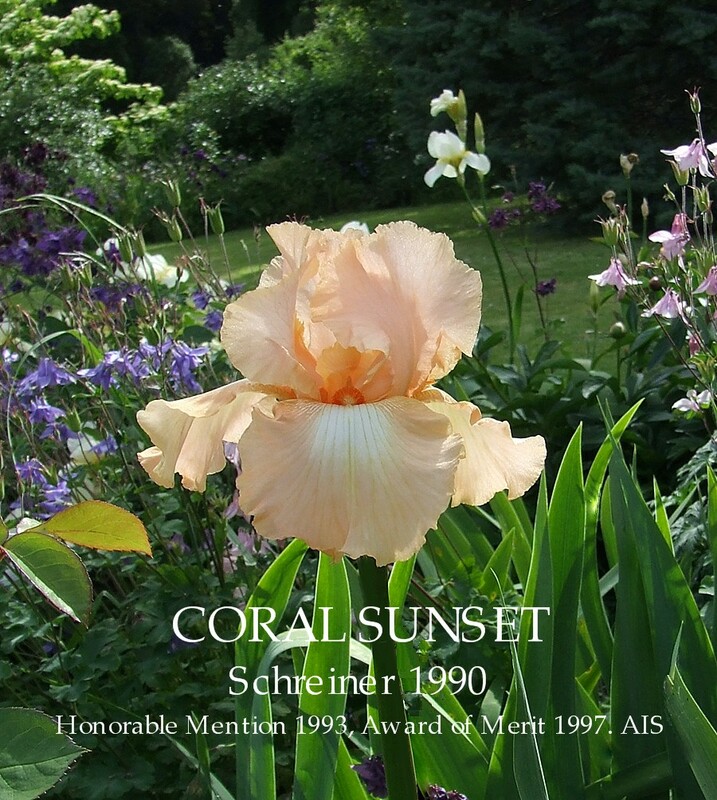 Extraordinary Apricot Orange Irises are not all that common surprisingly, and when you find a good one it instantly becomes a keeper, so needless to say Schreiner's 'Coral Sunset' is not an iris that will be leaving home any time soon. A strong apricot orange colouration that is sun fast and has most likely inherited the clean white centre on its falls from its parent 'Piping Hot' (Schriener's 1981). Well balanced medium sized blooms on 3 branches with 7-8 buds almost always double socketed, all on strong stalks that stand up well to inclement weather. 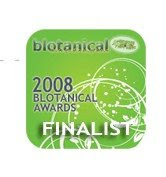 An exceptional healthy plant that shows average increase. CORAL SUNSET (Schreiner, 1990) ML 37"
CORAL SUNSET (Schreiner, R. 1990 Sdlg. S 589-2. TB, 37" (94 cm), ML, Shrimp apricot (RHS 32D); beards tangerine. H 834-5: (((Real Delight x Glittering Amber) x Orange Parade) x (Y 1468-A: ((June Meredith x Lynn Hall) x Fairy Fable) x Esther Fay)) X Piping Hot. Schreiner 1990. HM 1993, AM 1997 . Hi folks, a great heads up. 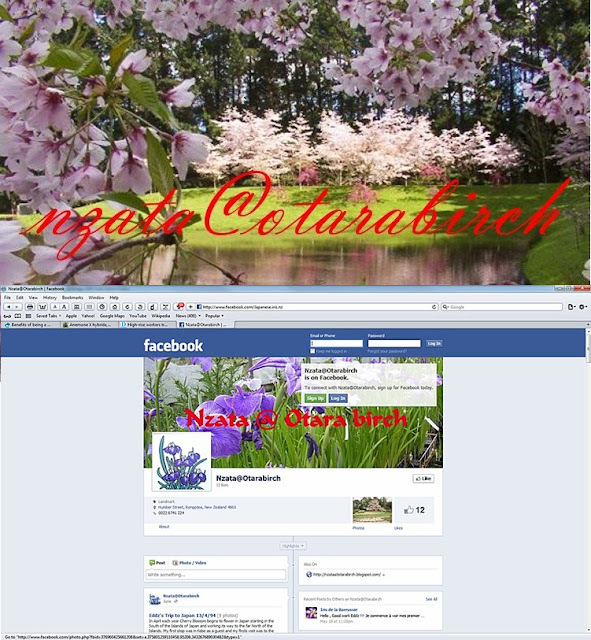 Eddie Johns of Otara Birch Gardens has had the blog nzata@otarabirch which has being around a good while. The situation has changed a little with Eddie now having returned to better health and has started posting on Facebook where he has loaded up the page with some great photos of his extraordinary seedlings and is inviting visitors to the page to leave their comments! Here's hoping he starts registering them, because they are very classy seedlings and god knows its been a long time since any world class Japanese irises have been introduced in New Zealand. Otara Birch Gardens grows New Zealand's Premier Collection of Japanese Irises and there would be no better selection of these very fine irises anywhere else in the country. The blog is still there with all that valuable information and available to all visitors so if you are starting to ponder on how to start sowing that Japanese or Siberian Iris seed you have put away in the cupboard, now would be a good time to pay the blog a visit. Just click on the image above and head on over. Don't forget to Bookmark the new Facebook page, and leave some words of encouragement!!!! Strong growth, bold colour tones, blooms make a distinctly striking statement, it's the multi-award winning 'Thornbird'. So what's not to like ?? There were 97 entries in this Long Term trial of Tall Bearded Iris which were assessed by the Joint Iris Committee over three years. All Tall Bearded Iris recommended for the Award of Garden Merit need to have the following qualities: weather resistance several flowering stems a minimum of six buds per stem. 'Thornbird' Award of Garden Merit Royal Horticultural Society. Stands well; good garden plant; good substance Available from The Iris Garden, and Seagate Irises. The famous Thornbird (Byers) is and always will be controversial. One of those “love-it or hate-it” kind of irises – or one that some “love to hate”. The colors can be very coarse, but those dramatic deep violet horns popping up out of the middle are certainly unforgettable. THORNBIRD (Byers '89 M 92cm) Pale ecru-tan standards, green tan falls with darker hafts and mustard tipped purple horned beards. Unique. You either love it or hate it. Most popular. 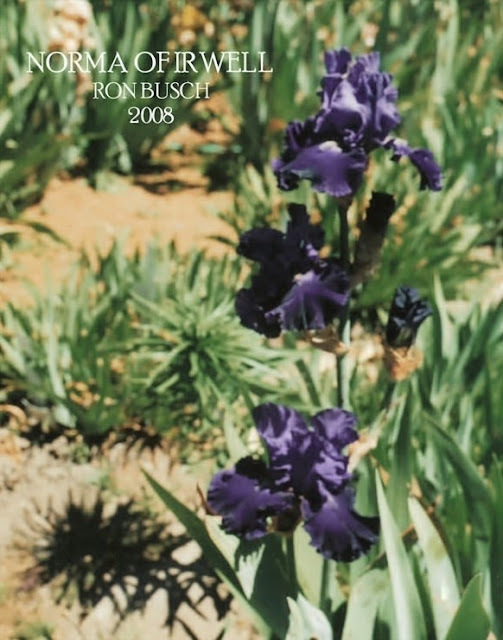 Cooleys Gardens, Silverton, Oregon, 2000 Iris Fanciers Standard Reference Book. This 1997 Dykes Medal winner exhibits such striking unusual colour. The falls are greenish tan, deeper at the hafts.deep violet lines radiate from the beard and suffuse into the centre. The standards are pale ecru. The beards are violet tipped mustard.Bold violet horns grow from the beard. Mild ruffling. HM '91, AM '93, Dykes 97. Schreiner's, Salem,Oregon, 2000 Iris Lovers Catalog. THORNBIRD (Byers 1989) ML 37"
This is a most distinct Iris, the dark violet horns extending and inch or more from the beards. Like talons, they create an appealing contrast to the flowers delicate shadings. These ecru and greenish tan shades are lighter in the standards and darker in the falls. A prolific bloomer. 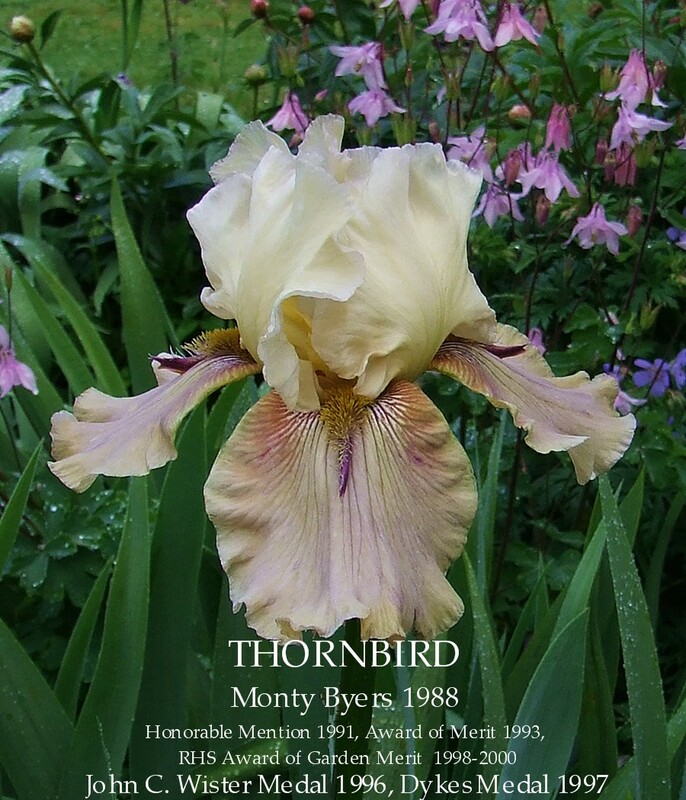 Thornbird often yields more than one stem per rhizome.HM '91, AM '93, Wister '96, Dykes 97. THORNBIRD Monty Byers, Reg. 1988 Sdlg. D156-1-B. TB, 35" (89 cm), M ; S. pale ecru; F. greenish tan, deeper at hafts which are overlaid with deep violet lines radiating out from around beard and suffusing into center; violet beard tipped mustard, violet horns or spoons; lightly ruffled; slight sweet fragrance. Art of Raphael X B-8-2: (Cease-Fire x Sky Hooks). Moonshine Gardens 1989. HM 1991, AM 1993, Wister 1996, Dykes 1997. There are many Commercial gardens still selling this iris both in New Zealand and Internationally. For some amazing photos of 'Thornbird' taken in Europe just yesterday visit the Extraordinary Barashka Blog really good photography! !